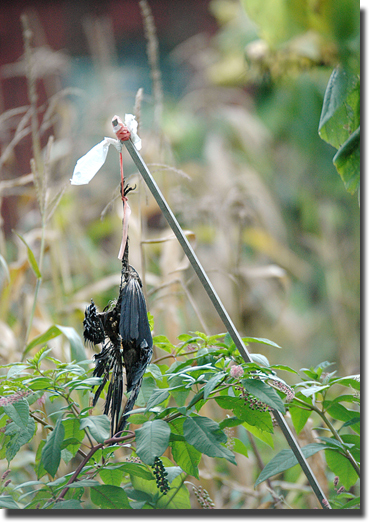 The first thing that came to my mind when I saw this dead bird hanging from the pole was that there must be some bizarre Appalachian/Mafia connection happening 'round here. The very next thing that came to my mind was to get the heck out of that spooky garden. Seriously, I was minding someone else's business and snapping photos of a pumpkin patch, when the wind blew the carcass and it caught my attention. But I was mesmerized and stared at it for too long. If I had been a silly teenager in a horror flick, I'd be dead already. I returned to work and showed my find. No one had ever encountered such a thing. I went to the trusty internet and found out that here in the Appalachians, it is believed that dead crows scare live crows and Marie, too! Crows can be a problem in Spring gardens. They can work down a row pulling up recently sprouted corn to eat the remaining seed/seedlings. In the southern Appalachians another common method of scaring off crows was use of a dead crow hung upside down from a pole.